On Friday we continued east on the GCICW (GULF Coast Inter Coastal Waterway) from The Wharf Marina in Orange Beach Alabama to The Santa Rosa Yacht Club in Pensacola Florida. We arrived at Santa Rosa Yacht Club. It is a private club but does have 2 transient slips. You cannot reserve the slips, but harbor master Howard had assured me on Thursday that we could get in on Friday. We chose Santa Rosa due to: great ratings on Active Captain, the fact that it was just off the ICW, and the marina is centrally located between Pensacola Beach & Downtown Pensacola. There are other marinas on Pensacola Beach, but lots of warnings about shallow water. Friday night we had dinner with our ole pals from Pharm Life (Dennis/Dana). It had been over a month since we last saw them at Florence Harbor. We had borrowed their DVD about Muscle Shoals and were finally able to return it to them. 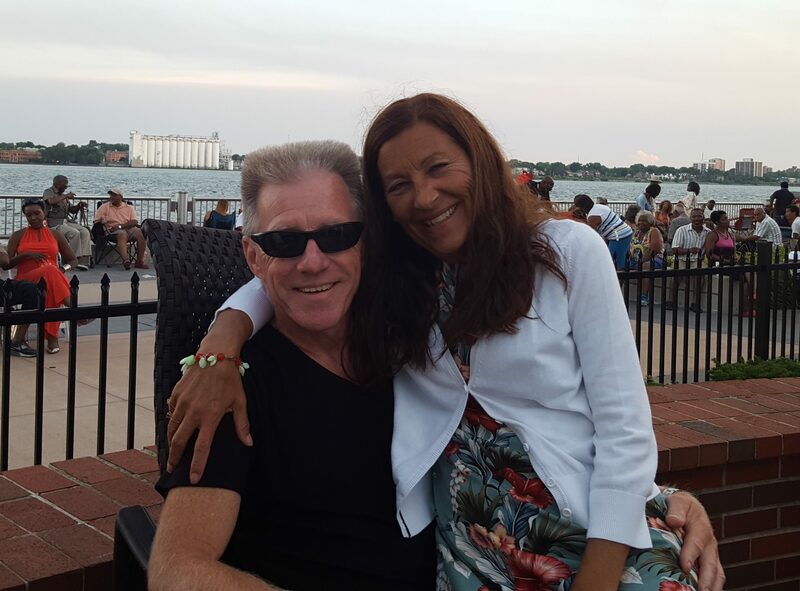 Dennis & Dana were staying at a marina called Palafox in downtown Pensacola. As we arrived, Dana met us at the front gate, and while walking to their boat we watched the end of a fish cleaning task. Dana said that 1 hour prior to us arriving, the fish was a Tuna about as big as her (5ft long). We took an Uber to their marina and walked to the downtown for dinner at a place called The Global Grill. I had a Cajun BBQ Shrimp Tapas & Nellie had a Potato Encrusted White Fish. During our 30 minute walk from the marina to the restaurant, we were treated to a downtown festival complete with street bands, beer, many people, and CHRISTMAS DECORATIONS already ! The town was really alive. On Saturday, we rode bikes over the bridge from Santa Rosa Marina to Pensacola Beach, about a 2 mile ride. We stopped at a place called the Casino Beach Bar/Grill. Luckily for my finances, there was no casino for Nellie, just restaurants, bars, gift shops. We had lunch, watched the Michigan Wolverines tease us with an attempted victory over undefeated Wisconsin (we lost 24-10), and laid out on the beach for several hours. The weather was 78f but with intermittent clouds and lots of wind making it feel cool (not swimming weather yet). On Saturday night we were a bit tuckered from the day at the beach, so we laid low, spoke with my sister Brenda (#2) and son Dan, had Domino’s pizza delivered, did laundry, AND SET OFF THE ALARM TO THE MARINA. When we arrived and checked in, the marina gave us a key to the courtesy room & exercise rooms. The marina did not have cable TV at the slips, and we could only receive 1 channel with the air antenna. We were not really in the mood for the normal Netflicks (NCIS, Cheers, Mad Men), and did not really want to fire up a long movie, so we decided to go watch the cable TV in the courtesy room. As soon as I unlocked & opened the door (about 8pm) a very LOUD alarm went off and would not time out and shut off. We were the only boaters around, the marina was empty of regular members and the harbor master office was closed. I attempted to call the harbor master using the after hours contact number, but there was no answer. Shortly after attempting to contact the harbor master, I was in the courtesy room watching TV (Nellie was in the women’s shower room), the alarm was still going off outside, and A POLICE OFFICER ARRIVED. I told him what happened, he did a check on my license, and asked to see the key that I used to open the courtesy room. But Jonell had the key in the women’s shower room. So me & the officer had to go beat on the women’s shower room door to get the key from Nellie. She was right in the middle of the shower, heard me yelling, put on a towel, and handed me the key through a slightly opened door. The officer & I went back to the courtesy room, shut off the TV, used the key to lock the door, and he shut off the alarm. Afterward, the officer & I talked about boats, The Loop, his boat, Pensacola, metro Detroit, etc. Unfortunately, I was a bit frazzled and did not remember to get a photo of the officer for the blog. On Sunday morning we spoke to the harbor master, and he apologized for not setting the alarm bypass. He said that they get so few transients that he forgot to set the bypass. The night was not over yet. After going to bed about 11pm, We were awaken 3 times by the HILLACIOUS 40mph WINDS. We got up 2 times to re-snug lines, add an extra line, and reposition some bumpers. We got up 1 time just to go out again and watch all the boats exercise their docking lines to the fullest extent of their tensile strength. Many of the member boats were dancing much more than Gettin’ Looped. The water was loudly slapping up against the hull of the boat all night. It was a very uncomfortable night. Sunday was a very laid back day. It was cool (high of 65f) and still windy. We wrote the blog, watched Football & the NASCAR final race (congrat’s Martin Truex Jr, farewell Earnhardt Jr), and went to dinner at a place called Peg Leg Pete’s Oyster Bar on the Pensacola Beach side of the GCICW. Peg Leg Pete’s owns and operates their own seafood market and fleet of fish/shrimp boats in Pensacola for an advertised daily fresh catch. The ambiance of the place was great and the crowd was packed for a Sunday/school night (I thought most folks are supposed to be at home on Sunday night, gettin in their work mood) . I had Grouper stuffed with crab meat, covered in some kind of white sauce. Nellie had a combo plate with fried Grouper, Oysters, Shrimp, & Scallops. I’m glad to see that the English classes are paying off. But a C+ is very strict. Great job Mike. Keep the posts coming. What an experience. What a wonderful adventure! Happy Turkey Day! Catching up on lots of posts! Congrats on reaching the Gulf! Cool… 65F… HAHAHAHAHA. It snowed here today. You and Nellie look so relaxed and happy! Well deserved trip of a lifetime for you both! Thank you for all the detail, even if Dan thinks it’s too much info! I love it! P.S. The “storm” just left Dog River. Heading your way!